Have you ever been out and about with your stroller and just NEEDED more space? Baby-Bee Haven has that figure out for you! This AWESOME oraganizer helps keep baby entertained and provides more space for your items. Baby-Bee Haven gave MamaBreak this item to review. Check it out! With all the crazy weather, we haven't used our organizer on the stroller outside, but we have used it a lot with big brother helping push and "Shop" at different "stores" (rooms) in our home. We also love that the kiddo in the stroller can SEE and BE entertained with an ipad/tablet or dvd player section. Not sure what to get a new mom, THIS is it. Fits MANY MANY stroller types, is a super soft, flexible and cool fabric. Holds more stuff when mom needs access to it--fast. They have other cool helpful products on their website--and see what their followers are saying on Facebook! Want to win one for yourself!? Enter below for a HOT shower item or a new addition to your spring stroller crew! The See N Store looks like such a great product. So many strollers just don't have enough accessible storage. 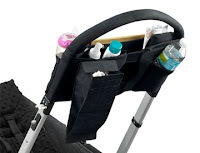 Who COULDN'T use more stroller storage? This is a fantastic idea! Sure could use more storage for our stroller!! I so need this! I always put everything underneath the stroller or in my purse - both of which take ages to dig through. love storage!! never have enough room!